Editor’s Note: Updated at 5 a.m. EDT (0900 GMT) after confirmation of successful launch. A Russian Progress freighter carrying nearly three tons of fuel, cargo and supplies for the International Space Station took off from Kazakhstan Saturday, two days after an uncommon last-minute abort for its Soyuz booster. The unpiloted Progress MS-07 supply ship launched from the Baikonur Cosmodrome in Kazakhstan at 0846:53 GMT (4:46:53 a.m. EDT; 2:46:53 p.m. Baikonur time) Saturday to kick off a two-day pursuit of the orbiting research laboratory flying 250 miles (400 kilometers) above the planet. A launch attempt Thursday was halted in the final minute of the countdown, a rare occurrence in the Russian space program. Russian officials have not publicly disclosed the reason for Thursday’s abort. The scrubbed launch forced Russian officials to discard plans to send the Progress MS-07 spacecraft on an express trip to the space station, which would have resulted in docking with the research lab’s Pirs module three-and-a-half hours after liftoff, a record-fast journey to the orbiting outpost. 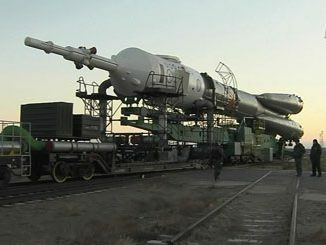 But the expedited approach requires a special alignment between the Baikonur launch base and the space station’s orbit, conditions that were not available Saturday. A maneuver to adjust the station’s orbit in late September was programmed to make the fast-track rendezvous possible for Thursday’s launch attempt. 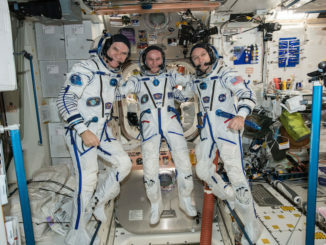 Russian managers want to launch future station crews on similar quick trips to reduce workloads for cosmonauts and ground controllers, and to allow crews to get out of the cramped quarters of their Soyuz capsules sooner. Station crews typically launch on trajectories that take them to their destination in about six hours, but two-day trips were the standard early in the space station program until Progress missions started testing accelerated approaches in 2012, followed by adoption on Soyuz crew flights in 2013. 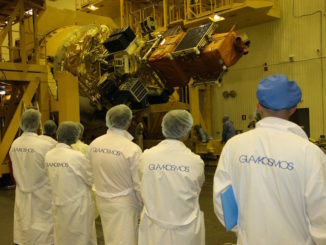 But the expedited rendezvous profiles are only possible when the space station is very close to the launch site, and the laws of astrodynamics dictate a two-day, 34-orbit rendezvous after Saturday’s liftoff, leading to an automated radar-guided linkup with the Pirs docking compartment Monday at 1109 GMT (7:09 a.m. EDT). 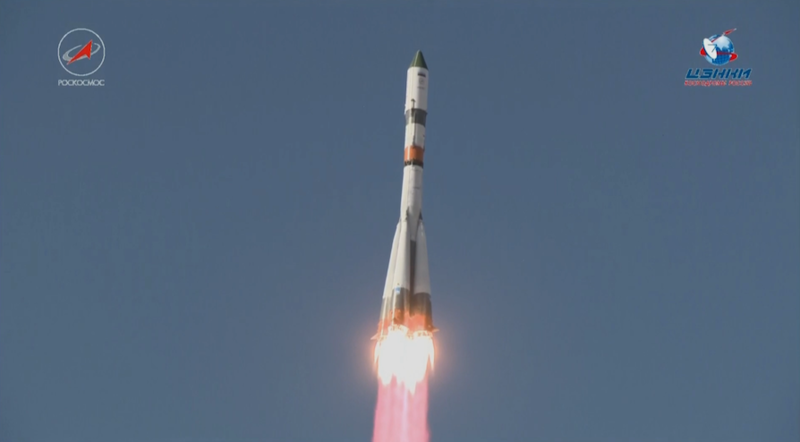 A Soyuz-2.1a rocket sent the Progress supply ship aloft toward the northeast from Launch Pad No. 31 at the historic Central Asia spaceport. Four kerosene-fueled strap-on boosters shut down and jettisoned around two minutes after liftoff, and the Soyuz core stage continued firing until nearly T+plus 5 minutes. A third stage RD-0110 engine ignited to propel the Progress MS-07 spacecraft into a preliminary orbit. The Progress supply ship separated from the Soyuz third stage around nine minutes into the mission, then immediately unfurled two power-generating solar array wings and a suite of navigation antennas, according to NASA. Multiple engine firings Saturday and Sunday will fine-tune the Progress spacecraft’s trek to the space station, and the cargo craft’s on-board computer will start an automated rendezvous sequence around 0848 GMT (4:48 a.m. EDT) Monday. The supply ship will approach the station with the aid of a Kurs rendezvous radar, then align itself with the Pirs docking compartment for the final linkup. The Progress MS-07 spacecraft will deliver around 2.9 tons (2.7 metric tons) of supplies and provisions. The payload includes 1,940 pounds (880 kilograms) of propellant to refuel the station’s Zvezda service module, 51 pounds (23 kilograms) of oxygen and 53 pounds (24 kilograms) of air to replenish the station’s atmosphere, 926 pounds (420 kilograms) of water, and 2,976 pounds (1,350 kilograms) of dry cargo, food, spare parts and other equipment for the station’s six-person crew. Once the Progress arrives at the station, Expedition 53 commander Randy Bresnik and flight engineer Joe Acaba will prepare for a spacewalk Friday, Oct. 20, to accomplish a variety of maintenance tasks outside the complex. Their duties will include the replacement of a fuse on the station’s Canadian-built Dextre robot, replace an external camera and light fixture, and remove thermal insulation from two spare units to prepare them for future relocation. The spacewalk was previously scheduled for Wednesday, Oct. 18, but NASA rescheduled the excursion and juggled some of the astronauts’ tasks. The planned lubrication of the robotic arm’s new end effector, or hand, will be completed on a future spacewalk. The Progress MS-07 spacecraft is set to remain at the space station until March, when it will undock and re-enter Earth’s atmosphere, burning up over the South Pacific Ocean.